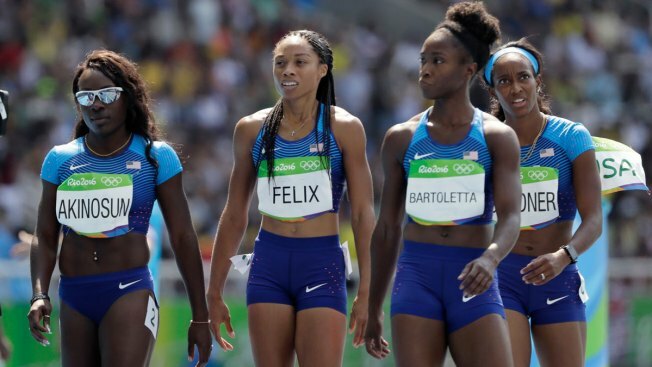 From left, the United States 4x100-meter relay team Morolake Akinosun, Allyson Felix, Tianna Bartoletta and English Gardner walk to the finish after dropping the baton during the athletics competitions of the 2016 Summer Olympics at the Olympic stadium in Rio de Janeiro, Brazil, Thursday, Aug. 18, 2016. Allyson Felix and the US 4x100 relay team made the best of a second chance, qualifying easily Thursday night in a solo re-run of the heat in which Felix got jostled and lost control of the baton. Race officials upheld an American protest and the US made it around the track safely and quickly — their time of 41.77 seconds wound up best among the qualifiers. These were hardly ideal conditions. The lead-off runner, Bartoletta, returned to the track a little more than 12 hours after taking gold in the long jump. Felix has been battling a sore ankle for months, along with the emotions of not qualifying for the 200, then finishing a disappointing second in the 400. Asked if she got hurt amid the jostling Thursday morning, Felix said: "No. Just upset." Replays of the race show Brazil's third runner, Kauiza Venancio, start to pump her arms as she gets ready to receive the baton from Franciela Krasucki. Venacio's left arm made contact with Felix's right one and threw her off balance as she was attempting to pass to Gardner. Felix let out a yelp as her flip missed its mark and the baton tumbled to the ground. She picked up the baton and told Gardner to finish the race a heads-up move that may not have really changed anything, per the rulebook, but removed any doubt about the U.S team's intention to finish the race. Anchor runner Morolake Akinosun finished but the Americans didn't post an official time listed as a "DQ," until officials let them back in. "I remember them telling us, if there's an appeal, you have to make an effort," Felix said. In less-jarring news, the U.S. men's team coasted through the preliminaries easily, winning their heat in 37.65 seconds. Jamaica's relay team also made it through, finishing second in their heat without Usain Bolt, who was resting up for the 200-meter final later in the evening. It puts Jamaica, and Bolt, in position for a third straight title in the sprint relay. "The only pressure is to make sure we get the stick'" around, said Asafa Powell, the former world-record holder who ran the third leg. It's been more of a problem with the United States than the Jamaicans over the years. The U.S. women dropped the baton in both the 2004 and 2008 Olympics to give away potential medals in an event that was virtually made for the team with the deepest pool of sprinters. The U.S. men have either been disqualified or failed to get the baton around the track eight times at Olympics or world championships since 1995. "First thing I did is told the young guys, 'We got this,'" veteran Tyson Gay said after running the men's third leg. "You've got to be positive. A lot of things happen out there."